Joan Darlington studied Fine Art at Birmingham and then followed a teaching career for a number of years. After taking early retirement from teaching she set up her own studio where she works in a variety of media. Her preferred painting medium is oils but she also uses acrylic, watercolour, pen, wash and crayon. She also sculpts in wood, her subjects are always figures. She has a particular interest in the narrative aspect of painting, creating an idiosyncratic mix of myth, legend and her own sense of fun. The result is a rich tapestry of colour offering a variety of interpretations, leading her audience to question the activities and the circumstances which she depicts. 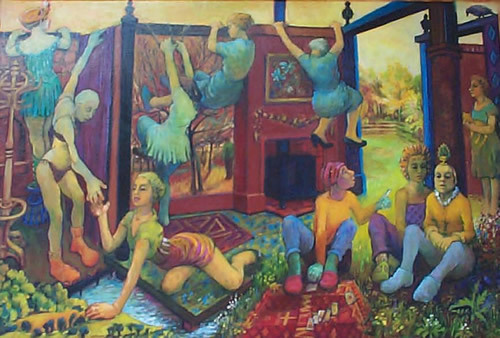 Joan’s work is exhibited in private galleries throughout the country. She takes great pleasure in her painting and her aim is to stimulate interest and enjoyment in those who see her work.